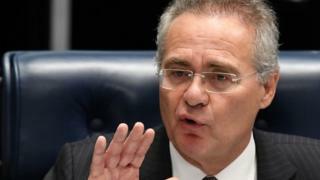 The president of the Brazilian senate is to be tried for alleged corruption, the country's supreme court has ruled. Renan Calheiros, a major ally of President Michel Temer, is accused of misappropriating public funds in a case dating back to 2007. He was forced to resign as senate leader at the time, but was re-elected six years later. He denies wrongdoing. Mr Calheiros, 61, is being investigated separately in the huge corruption case involving the Petrobras oil company. Mr Temer took over the presidency in August, when an impeachment vote found his predecessor Dilma Rousseff guilty of breaking budget laws. He has vowed to clean up Brazilian politics, but has lost three ministers to corruption allegations. The revival of the 2007 case against Mr Calheiros is a further blow to the president's efforts to mend Brazil's dire public finances. The case centres on child support payments made by the senate president for a daughter he had in an extramarital affair. He is accused of channelling the payments through a construction company which billed the senate. Mr Calheiros is also a target of the police investigation named "Car Wash", which has unveiled a massive corruption scheme at state-owned Petrobras over many years. Dozens of politicians and Petrobras executives have been arrested and sentenced in the scandal, which overshadowed Ms Rousseff's presidency. Brazil's oil: Blessing or curse?